British support services and construction firm Carillion (CLLN.L) expects to announce more contract wins in the United Arab Emirates in coming months as it braces for an uptick in construction activity in the Middle East. Carillion, whose Middle East construction arm accounts for a tenth of its business, wants to increase the unit’s revenue to 1 billion pounds ($1.6 billion) by 2015, but activity has been has slow as the euro zone crisis crimped project financing. “The United Arab Emirates, Abu Dhabi and Dubai have been slow but we are starting to see signs of improvement in those economies,” Chief Executive Richard Howson told Reuters on Thursday. “We’ve won nearly 600 million pounds of the work in the last 6-8 months in the United Arab Emirates and we expect that we’ll announce further wins over the next couple of months there,” he said. He said he expected improved activity in Qatar, host of the 2022 World Cup, from the end of 2014 as the government invests in infrastructure in its capital Doha ahead of the event. Carillion, which also maintains UK railways and military bases, has been looking to expand its construction presence in Canada and the Middle East to make up for a shrinking UK construction arm. 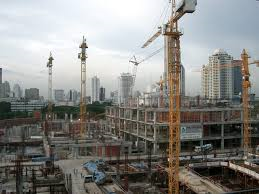 Construction makes up about 45 percent of its business, with support services accounting for the remainder. It said its order book had grown to 18.4 billion pounds from 18.1 billion pounds at the end of 2012 after it won contracts on projects such as London’s Battersea Power Station and support services contracts in the oil sector. Underlying first-half pretax profit for the six months to the end of June rose to 73.5 million pounds from 72.4 million pounds. Revenue fell 9 percent to 1.96 billion pounds, due to the resizing of its UK construction business, Carillion said. Howson said the scaling down of its UK construction business, which has halved since 2010 as Carillion stopped bidding on lower-value regional projects, was now complete and he expected second-half revenue in the segment to be higher than first-half revenue of 503.8 million pounds. Morgan Stanley analysts called Carillion’s results “a mixed bag”, pointing to a 6 percent fall in support services revenue to 1.1 billion pounds after two customers took contracts in-house.